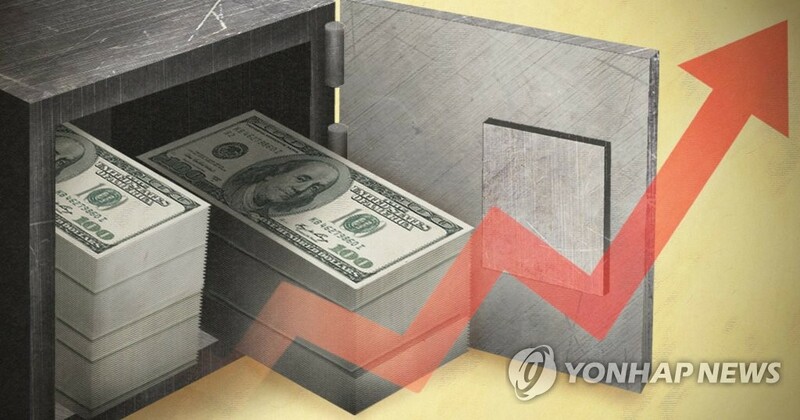 (SEOUL=Yonhap News) South Korea's foreign exchange reserves edged up in November on a slight depreciation of the U.S. dollar, the central bank said Wednesday. The total value of its foreign currency holdings came to US$402.99 billion as of end-November, up $240 million from a month earlier, according to the Bank of Korea (BOK). It slightly lagged behind the all-time high of $403 billion tallied in September. The BOK said the trend of a strengthening U.S. dollar slowed down to some extent in November, increasing the value of non-dollar currencies when converted into the greenback. In November, the U.S. dollar index retreated 0.2 percent on-month against the currencies of six major economies. The value of foreign securities, such as government bonds and corporate debts, amounted to $376.25 billion last month, up $470 million from a month earlier. Foreign currency-denominated deposits fell $190 million on-month to $16.53 billion in November. The country's reserve position at the IMF stood at $2 billion at the end of November, while holdings in gold bullion were also unchanged at $4.79 billion during the same period, the central bank said. As of end-October, South Korea ranked eighth in the world in terms of the amount of foreign reserve holdings. China topped the list, followed by Japan, Switzerland, Saudi Arabia and Taiwan, according to the BOK.